Pictures by Kathy Mansfield can be viewed at http://is.gd/pbXxDj . Thanks to David Pannell for pointing this one out. Friday 12th July at the inaugural World Skiffies saw the ladies preparing for their over 40's heat. With one member of their team in their forties, it meant competing in a younger category. 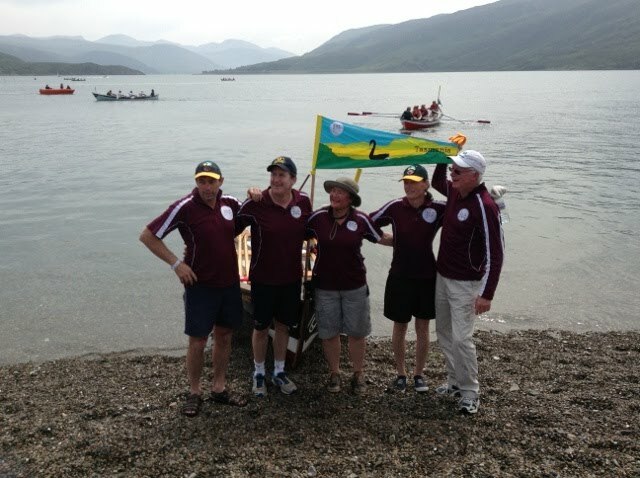 Aiming to better their previous best of 15 mins and 3 seconds, they rowed brilliantly on another perfect Scottish day, to pull over the line in a new record of 15 and 2 seconds. The first seven in each of 2 heats made the final, and had they been in the second heat, they would easily have qualified with their new pb. With a chance to take the day off to look around the area or relax and explore Ullapool, the Australian camp all had a lovely day absorbing the beautiful place they had travelled such a long way to see. With a trip south to Gairloch, passing near the magnificent scenic lochs, islands, mountains, waterfalls and quaint villages, it was a wonderful reward for all those hard training hours on the Huon River. Blisters, aches and general tiredness were all forgotten as local treats and treasures were found for the communal evening meal at Arkle, 16 Market St Ullapool, temporary base for the Australian flag and team. On their return, the ladies again prepared for a new and exciting spectator event, the 250m sprint, from the wee pier to the harbour. Again, aiming to beat 100 seconds, the chaotic sprung loaded race saw the ladies almost beat a men's team, and cross the sail finishing line in 97 seconds. Cheers from the crowd, hotel patrons overlooking the water and a 3 year old Scottish boy shouting Come on Tasmania were recorded by filmmaker Wendy Brown. Team 2 in the mixed sprints did as well, if not better, bringing in a first and another good time under 100 seconds. Haggis, locally smoked salmon, farm produced pork sausages, and local mashed potato and swede was a fitting reward for great participation. Ian Outred, designer of the St Ayles Skiff that the WOW group had built in Franklin, and the reason for the world championships, was also one of the competitors. 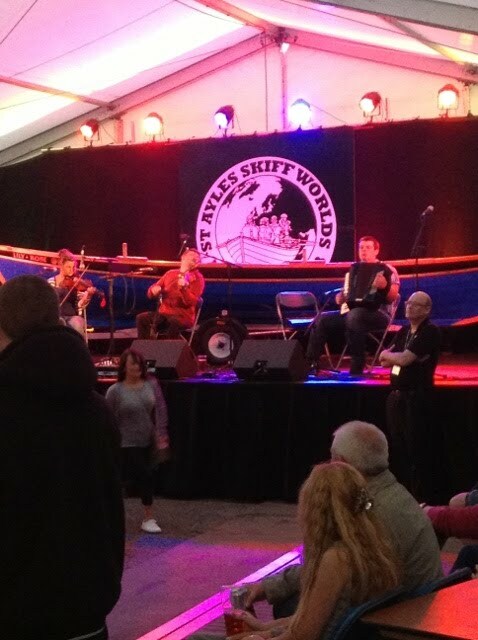 The evening offered music and dancing in different venues throughout the town, from the marquee at the Stornoway ferry terminal to the five or more village hotels, and wound up on the beach with a bonfire sharing stories with local and international teams. Saturday marks the last competing day, with the open events, and a windup ceilidh...Scottish party. The sea breeze was in making the crossing wild and wet but the team worked hard to come in halfway through the field, qualifying for the final scheduled for Thursday...huge cheers from the beach and a new first for Franklin, breaking the 15min barrier for the first time ever. The final event for the day was a rescheduled long row of 6.4km for the women, which was cancelled the day before due to thick fog. 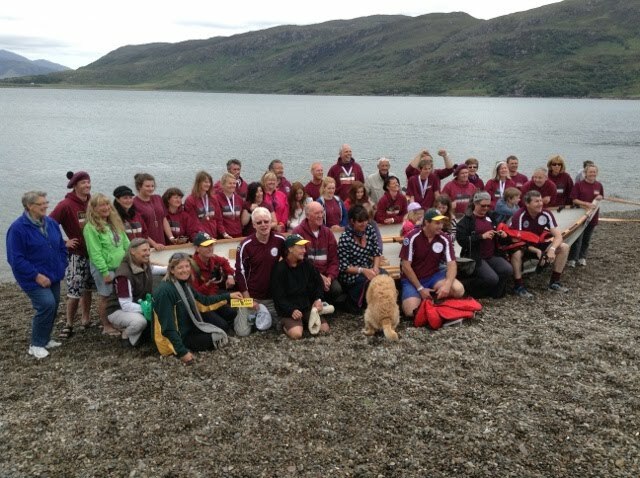 This time the course was set south across Loch Broom and returning into the stiff sea breeze. Deb made her debut in the team, with the reward of a proud third placing. Berwick and Ullapool had crew in their thirties, so a great result for the average age of the Boatie Blest crew...Tasmania..of around 50. 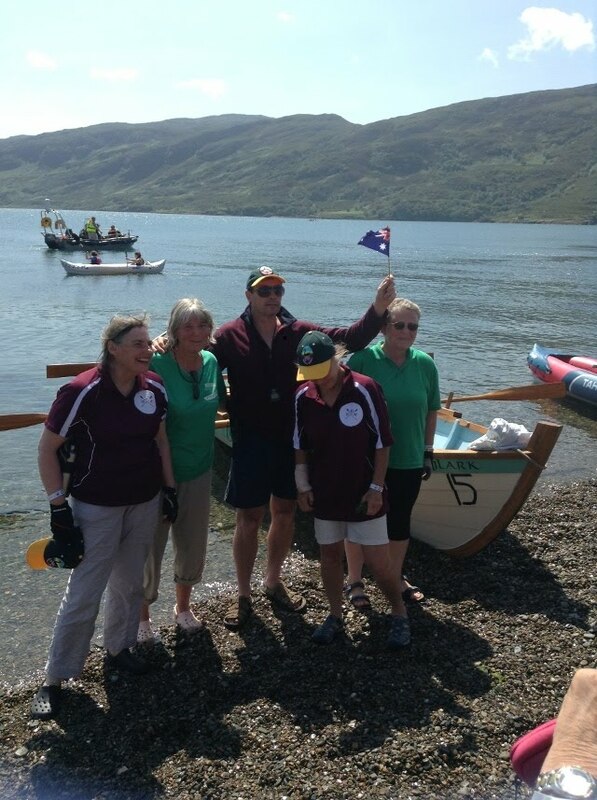 The colours of the Cockenzie club who had built the Skiff matched the Aussies so there was huge support and cheers from the beach for Boatie Blest. The incredible Loch scenery made the tired crew forget the aches, and the first cider at the Arch Inn overlooking the water slipped down beautifully....more tomorrow. 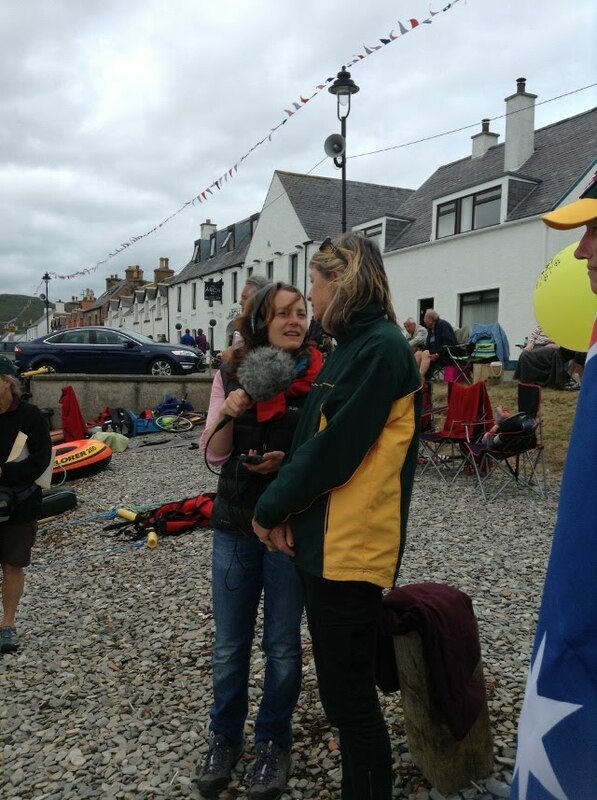 First reports from Jane Johnson (and pics from Wendy Brown) at the Ullapool (Scotland) St Ayles Skiff Championships. "The place is beautiful,yesterday was the opening day and Marguerite was interviewed by BBC and ITV so will watch tonight. Everyone so friendly and helpful. Today is the long race and we have a male team going against blizzard winds to Ardmair and our crew is returning...will let you know how that goes. 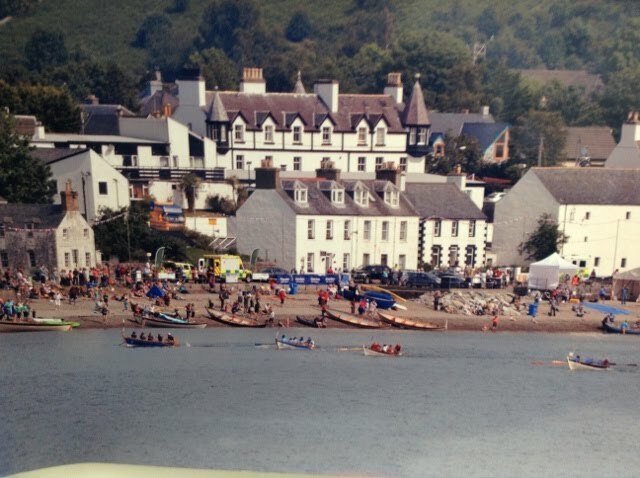 Yesterday perfect weather and met Princess Anne who spoke with genuine interest and enthusiasm - we did an oar salute...got to go ,Jane"
"Hi again....Yesterday's 4mile race to Ardmair was cancelled halfway due to fog! just like the Huon Valley fog! A male crew from Plockton took our borrowed boat,the Boatie Blest, borrowed from Portosoy near Edinburgh, on the outgoing voyage to Ardmair...as it got out to sea, hitting the strong winds,the race was called off. Fog lifted a few hours later...we had picnic overlooking the harbour at Ullapool and then had our second training run....tough conditions after you pull out of the safety of the harbour and cross the Loch! The trimmings of the skiffs are all different...designs have been improved with each boat built,so have taken photos! ours is the tenth to be built. 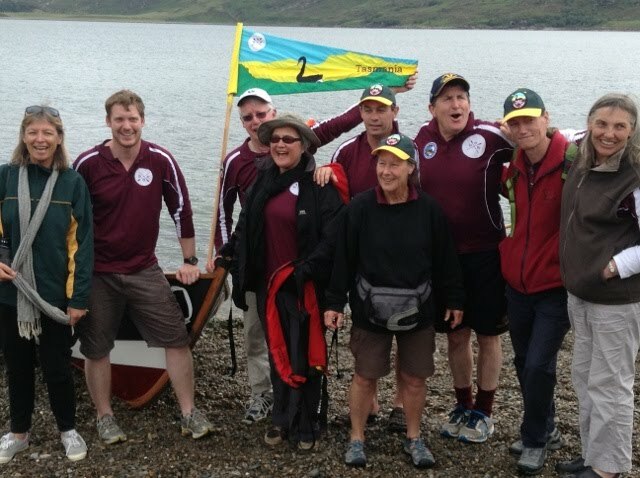 The whole St Ayles skiff phenomena has resulted in a resurgence in rowing and community spirit. New Zealand pulled out so all are impressed we made the long voyage, very supportive and helpful. Our support crew Shane,Martin,Wendy,Deb and Lou....Sister of Marguerite have been great...menus each day are incredible,sampling local produce. Today is the big start ...even though late nights for the Australian team sampling ciders and local entertainment may make it tricky to get started! Marg and Di row with Patsy and Pam from Portobello in the over 60's....Jane"